The Ultimate Green Store provides your eco-conscious a collection of the finest environmentally friendly products for you, your home, friends and family. A Wide Collection of Natural Products! The Ultimate Green Store provides an eco-conscious collection of the finest environmentally friendly products for you, your home, friends and family. The products are green in a number of ways; natural, organic, recycled, eco-friendly products that are made with your health and the health of our planet in mind. Baby Clothing, Toys, Blankets and Beddings: All baby products are made from organic cotton. It greatly reduce damage to the environment and human health as it's grown without synthetic pesticides or fertilizers. Kids: Toys, school bags, eco-school supplies and much more! Kitchen: All the kitchen products are easier on the environment and much better for your health. Choose from a variety of eco-friendly storage containers, utensils, bamboo kitchen tools, colanders, cutting boards, green cleaning products and much more! AND! The recycled glassware can be customized with etched logos or names for businesses or personal events. Skin Care: The natural and organic skincare products from The Ultimate Green Store is eco-friendly and much better for you, your children and the environment. The baby department you will find a full selection of natural & organic baby skincare & bath products. For more information about particular formulations you can look at the product page for the specific product you want. The Ultimate Green Store IS the Ultimate Green Store as it has all you need for babies, your kitchen, skincare and much more. At the Ultimate Green Store, you will find that shopping green is a joyful as you will find beautiful, cool, hip, colorful, fun, effective, high quality products that stand on their own. Check it out and enjoy! Mission: Provide you with products that are made in a natural and easy way, where the importance of sustainable practices, production and social responsibility are fully recognized. Provide your baby and the environment with safe and healthier products. 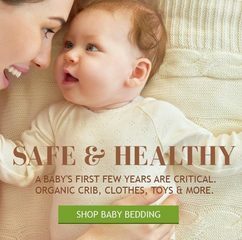 The Ultimate Green Store is where you find a wide selection of organic baby clothes and toys made from organic materials.